Pipevine Swallowtails (Battus philenor) are one of the ten species of swallowtail butterflies found in Florida. Pipevine Swallowtails don't appear as colorful as other swallowtail butterflies until sunlight reveals the iridescent blue of their hindwings. The undersides of their wings, marked with cream and orange spots, are more typical of swallowtials. Pipevine Swallowtails are found in fields, brushy areas, and woods in central and northern Florida from February until November. They prefer to nectar on orange, pink, and purple flowers. 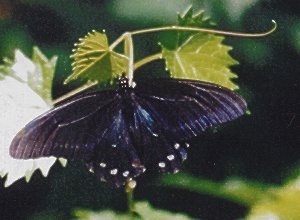 Adult butterflies have a wingspan of 2.25-3.5". Females tend to be larger than males but not as brightly marked. Reddish-brown eggs are laid in clusters of 1-20 on the underside of pipevine leaves. The caterpillars are dark brown with dark filaments and orange spots on the abdomen. The chrysalis is either green (when attached to rough surfaces such as tree trunks and twigs) or brown (when on smooth or yellow surfaces). The Photo Gallery contains more pictures of Pipevine Swallowtails.